Mundosparalelos Information Dance Plymouth Pole Yesterday I did something inspirational! Yesterday I did something inspirational! picture above - view from Mountbatten looking towards Plymouth City Centre. It is now nearly 6 years since I started teaching pole dancing and I, like many, have struggled to find suitable training courses to qualify me to teach pole dancing. There are pole dance teaching qualifications out there but I have seen some really bad pole dance teachers with specific pole dance qualifications and some great teachers who have no training at all. I think the problem is that like many art forms it takes years to get good at something and you can't walk onto a 1 or 2 day course and learn, in that time, to be a great pole dancing teacher. As a teacher I just wanted some more training so 2 years ago I attended an Exercise to Music course with the YMCA, the course gave me a great basic level of physiology and anatomy but I hated the aggressive style of aerobics and knew that it would not be something I ever wanted to teach. The ETM courses do not encourage expressive dance and instead encoruage regimental steps which is the complete opposite to my style of teaching, it may work for some but it didn't appeal to me. Since the ETM I have been looking for another course to aid and develop my teaching and I think that yesterday I found the answer; A few monhs ago I was perusing the Herald when I saw a small article on the Keep Fit Association, I took the details and contacted Mary Lakeman to find out more. Mary was extremely helpful and she put me in touch with Valerie Lacey, a course facilitator. To cut a long story short, Sue and I attended a 1 day workshop yesterday to learn more about music and movement and we both absolutely loved it! Janice Moore, a KFA trainer from Wiltshire, packed so much into the day that my head is now buzzing with ideas, we covered musical styles looking at the history of music and dance, we looked at different beats and adapting dance to suit different styles and we looked at Laban's fantastic principles of dance and movement. The course was perfectly pitched and wonderfully inspiring. I had my first go at the Paso Doble and the Cha Cha Cha and then we tried the Waltz, this is the bit where I must apologise to Tamsin who probably wished she had worn steel toe capped boots to work with me, the Waltz is much harder than it looks and my feet just didn't seem to land in the right place. I hope that Tamsin's toes are recovering today! There were 10 of us attending the course including Ruth who is still teaching at 82 and who stilll looks fabulous. Ruth even knew my first dance teacher Claire Cassidy who retired from teaching Margaret Morris Movement at the age of 83 and who still remains an inspiration to me. The ladies were extremely welcoming and I hope to meet up with some of them again soon. The KFA course has really made me want to train as a KFA teacher as well as wanting to fuse the KFA style wiht my pole dance teaching. I hope to try to develop some pole classes for the over 65's with exercise involving move around the pole and using the pole to help balance as opposed to the high impact gymnastics style I teach at present. Thanks to all the ladies from the KFA who I met yesterday for inspiring me and not judging me for teaching pole dancing. Before I disappear of to my 2 hour Pole Practice I must mention the awful meal I had at the China House yesterday. My husband had offered to take me out for a meal and we decided to pop down to the China House as I love the venue and because they do great beer. Unfortunately when we ordered the food no-one told us it would take nearly an hour to arrive, don't get me wrong, I don't mind waiting an hour for fresh home cooked food but I do mind waiting an hour for on over-microwaved pasta monstrosity. My husbands meal wasn't much better and was cold. We were going to complain to the staff but having waited for over an hour we were starving and were faced with the dilemma of queuing for ages to complain and then waiting another hour for more food or eating the food and vowing never to eat at the China House again. We opted for the latter which is such a shame it is such a lovely venue. 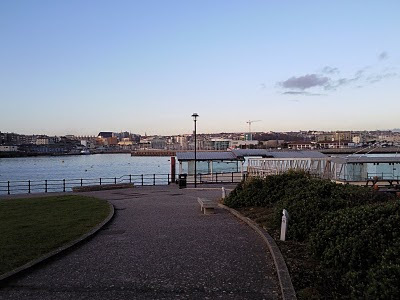 With the loss of the Waterfront recently and the closure of the dome many opportunities seem to be being missed from Plymouth and the lack of quality eateries does not bode well for tourists or locals. What a shame that many pubs and restaurants are no longer family run with real home cooked food but instead are being replaced by chains run establishments with everything being taken from the freezer to the microwave! Next time we eat out we will go back to a place where we can gurantee good service and great food such as Bistro One on Ebrington Street and the Mussel Inn at Down Thomas.